First edition, first printing, 1897. In 1897, L[yman]. 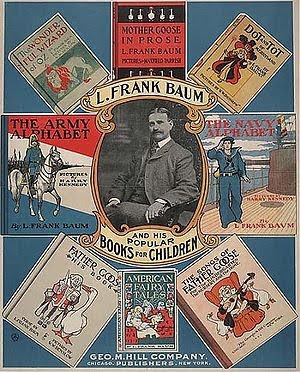 Frank Baum, age 41, after working for years as an amateur theatriste, poultry collector, retailer, journalist, and door-to-door salesman, had his first book published. Illustrated by Maxfield Parrish in the artist's book debut, Mother Goose In Prose was a moderate success. Though not a best-seller, it was popular enough to inspire one of the earliest tie-ins between a cereal manufacturer and child-oriented goods, now routine. "Avoid mushy, starchy, pasty breakfast cereals..."
Free copy with purchase of Pettijohn's Breakfast Food. He had been born into a wealthy family who indulged his youthful preoccupations - his father bought him a printing press and built a theater for him. But he had been cultivating failure with the care of an agronomist since leaving home. He must surely have seen this first book as a means to redeem himself for all the love and affection his parents heaped upon him, particularly the mother who had placed so much faith in him. 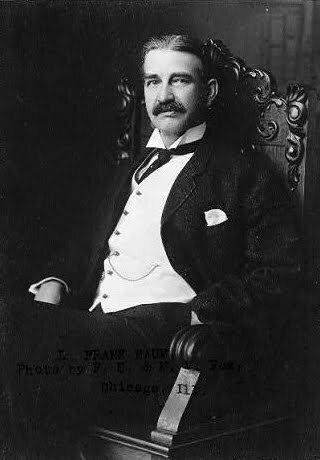 L. Frank Baum, c. 1901. At the time, he had been married to his wife, Maud, for fifteen years. No word on what Maud thought about it but, given the eternal conflict between mothers and daughters-in-law, to be relegated to second-class best friend status could not have been pleasing to her. Yet this copy will definitely please collectors of the works of L. Frank Baum, big time. Signed and/or inscribed copies of Baum books are quite scarce; he just didn't do it very often. This is a book that in its first edition, first printing is currently selling for $2,750 - $6500. Because of its status as Baum's first book, the first copy from the publisher, the utmost scarcity of Baum inscriptions, and the fact that the book is inscribed to his mother, this copy - which is without a doubt the nicest, most desirable copy extant - is being offered for $125,000. By 1901, The Wonderful Wizard of Oz had been written and published (1900) and L. Frank Baum had become an industry. Mama would have been proud. One puzzle, however, remains. Why is Baum signing his full name at the close of this inscription to his mother? Yes, he was the seventh of nine children but really, was the relationship that distant? Had Baum, a Methodist, been born Rosenbaum, a Hebraist, I suspect the inscription would have been a bit different. (Yes, I'm wearing the muffler you sent. No, I am not wearing the galoshes). Your little grown-up boychick, Frankele. Images of cover and inscription courtesy of Between the Covers. The combination of Baum and Parrish is irresistible to me. Your insight into his familial relationships gives new points to ponder. Another informative post! Such an informative post and I loved the Hebraist take on the inscription.